New Jerusalem heralds a return to a great deal of what made Christian Rock what it is today: hearkening back to hard music's blues-metal roots, the band has been both praised and criticized for sounding akin to late-70's and early 80's metal masters Led Zeppelin, Aerosmith, Rolling Stones, Barren Cross, Guardian, Slaughter, and Neon Cross. With virtuoso solos, dead-on vocal prowess, and a return to melody on metal, New Jerusalem is poised to return the fun to hard music as 1997 saw happen in the mainstream market. Based in Phoenix, Arizona, New Jerusalem is one of the few Bulletboy Music artists not hailing from the Southeastern U.S. The band's leader, and lead guitarist, Thurane Aung Khin is both an accomplished songwriter with several published hits, and a guitar virtuoso with jazz and rockabilly backgrounds. Vocalist Barry Jenkins plays the drums, while Phoenix native Brian Hutchison plays the bass. All band members are born-again Christians, and are accountable to local churches. Thurane was the music minister at Camelback Community Church, and currently attends Camelback Bible Church. The signing of New Jerusalem is a testament to the importance of the newly-formed National Association of Christian Rock Radio (NACRR) and to the band's own promotional instincts. Introduced to Bulletboy Vice President David Vanderpoel at NACRR's February summit in Indiana, the band was repeatedly recommended by reporting rock deejays to the label, leading to the first introductory steps in band/label relations. 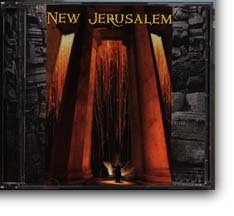 New Jerusalem has also shown outstanding self-promotional initiative, selling through hundreds of copies of their eponymous indie CD, touring with production in the Southwest U.S., marketing radio singles (one currently on rock charts), running national ads, and obtaining the endorsement of Cactus Game Design, the creator of the Redemption trading card game. Cactus now manufactures a collectible New Jerusalem card for their game that may be used to win the game. Bulletboy has spent the last six months seeking exactly the right band to use to reintroduce the Christian market to its early metal sounds of Jerusalem, Daniel Band, Barren Cross, and others. Bulletboy label owners have flown across and outside of the U.S. to showcase classic metal bands, including bands featuring former members of Stryper. Unsatisfied with their findings until now, Bulletboy is now gearing up to begin a major marketing campaign as the leaders of the return to 70's and 80's "hair metal" rock, with New Jerusalem at the forefront. Check out their other web sites at IUMA. New Jerusalem is aWorld Vision artist. Lyrics and sounds are here.